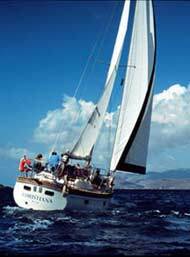 Sail the Aegean with an experienced and licensed skipper. The Christiana, a 10 meter Jeanneau Sunfiss, has 2 double cabins, a lounge with 2 bunks, a toilet, a kitchen with a fridge, a shower with hot water, and all necessary technical and safety provisions on board. 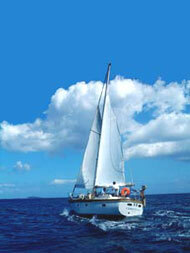 You can just relax on board, or participate actively in sailing the yacht. To those who are interested, the captain will also teach sailing. You need to bring suntan cream, a towel, some drinks and snacks for the journey, soft shoes to wear on board, and snorkels and swimming gear. You sail in the direction of Paros. En route there is a pause when you can snorkel and swim. The boat will continue to the fishing port of Naoussa, and later continue to the small bay of Santa Maria which has an excellent taverna where you can order a meal, and relax, swim and snorkel. In the late afternoon you sail back to Naxos port, and arrive about 7 pm. Sail to the small island of Koufonissia with its quiet and beautiful sand beaches, and its excellent local tavernas where fresh fish and seafood are a specialty. Tourism is relatively new to Koufonissia. The island is small enough to go anywhere on foot and there are no cars. A wonderful opportunity to enjoy a peaceful and beautiful environment. For maximum four persons. On the first day you sail to Amorgos, and the yacht will anchor in the port of Agiali. The next day you have an opportunity to explore the town of Agiali, and take a bus to the famous monastery of Hozoviotissa. On the 3d day you will sail to the small island of Keros, where you will anchor in a small bay to snorkel and swim. Later you will continue to Koufonissia where you will anchor for the night. On the 4th day the yacht will sail to Schinoussa, where you will pause for swimming and snorkeling, and where you can have a meal at a small local taverna. From Schinoussa, you will sail back to the port of Naxos. Charter the Season boat for one or several days and plan your own journey with the skipper. For overnight accommodation, the yacht can take maximal 4 persons. The use of bed linen is included in the price. Water is available on board, you have the use of the kitchen and the fridge, and there will be breaks in the sailing schedule to visit local tavernas. Day trips are 50 Euro per person. For reservations, please send an e-mail with the dates, number of persons and any other requirements.